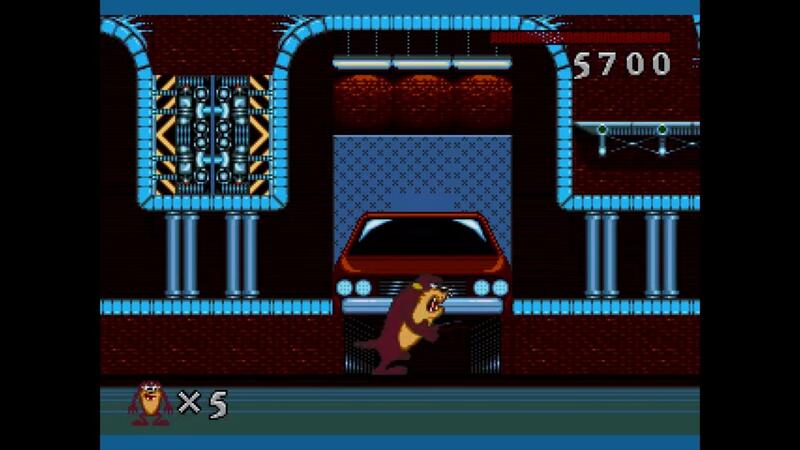 Cool a game based on Taz Mania, this is gonna be great………right? Taz Mania was a popular cartoon series based on the Tazmanian Devil from the Looney Tunes shorts, the show was about Taz and his family and the crazy antics they would get up too, I watched this show as a kid but I wasn’t a huge fan of it and unlike some other shows such as Ducktales and Chip and Dale Rescue Rangers I dont have many fond memories of watching Taz Mania. Taz Mania was fairly popular and just like many other cartoons of its era, video game developers started to create Taz Mania video games to make a quick buck but unlike Ducktales and Rescue Rangers whose games stayed on one system Taz Mania had a video game on a whole bunch of different systems including the Sega Genesis, Sega Master System, Sega Game Gear, Super Nintendo and the Nintendo Game Boy, unfortunately I haven’t yet gotten around to playing most of these but as a kid I used to play the Genesis version a lot and I remember really enjoying it, but was it good as I remember? 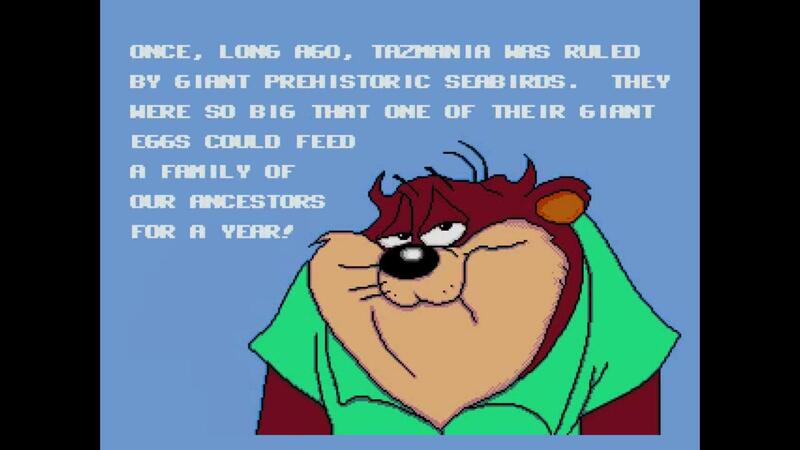 The games plot is simple and straight to the point, Taz and his siblings are told a story about giant sea birds that used to rule over Taz Mania, the birds were so big that if someone was to steal one of their eggs it would feed that thief and his entire family for one whole year, talk of these giant eggs make Taz hungry and he soon leaves on an adventure across Taz Mania to find one, like I said the plot is very simple and straight to the point I don’t mind this because firstly I was not expecting some epic storyline for a video game based on the Tazmanian Devil and secondly this honestly seems like something that Taz would do because at the end of the day he’s a wild animal who loves to eat so the thought of a giant egg is immediately going to get his attention. 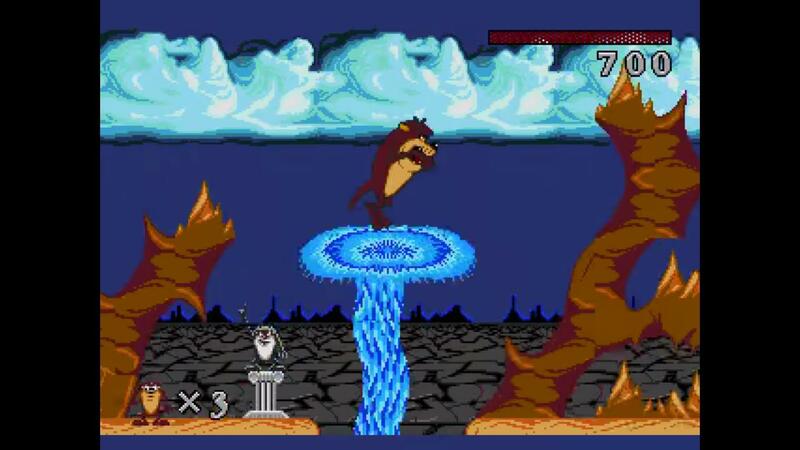 The game looks pretty good for a licensed Sega Genesis game, the graphics are not very realistic looking which isn’t a problem because they actually look a bit like the cartoon which is a nice touch from the game developers, it shows that they did research of the original cartoon and as a result both the genesis game and the show have a similar art style which is an aspect that many fans of the show will appreciate. Graphically the game is very impressive but the level design is awful, the biggest problem is the plat-forming because a lot of the platforms you need to jump to are off screen meaning that you need to takes risky jumps and leaps of faith hoping that you don’t fall to your death, another problem is that sometimes its very difficult to figure out what objects you are able to jump on, this gets very confusing because sometimes you are able to jump on platforms that are either in the background or the foreground while at other times you cant so its not easy to identify what is an actual platform and what is just there for scenery, speaking of scenery there really isn’t a lot of it and because of this all of the levels are very bare with just a few things pasted into the backgrounds, its really not that interesting to look at and its a shame considering all of the effort that went into the games art style. 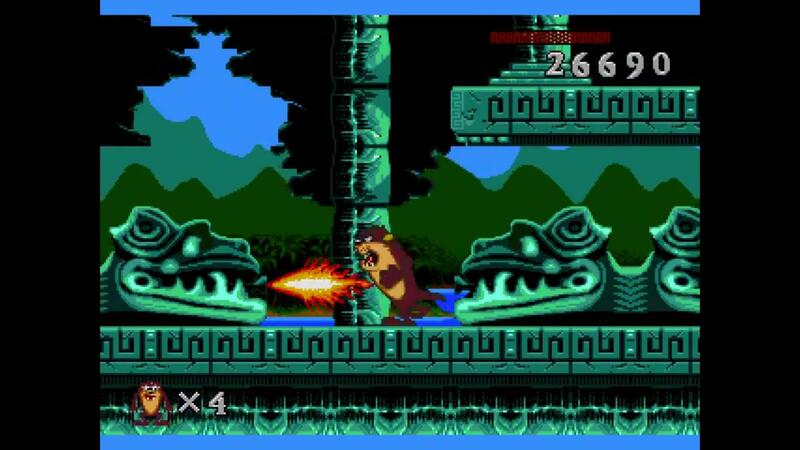 The game has very tight controls which are easy to remember, you control Taz with the D-Pad while the three other buttons are used to perform the games actions, such as Jumping, Spinning and breathing fire when its available. The most important ability in the game is spinning, Taz can spin really fast allowing him to knock enemies off of the screen but you must be careful because you are also able to get rid of special items such as lives and health if you accidentally spin into them. Taz will eat everything in his path and this can be very useful as he can eat enemies, lives and food but you must not eat any of the bombs, if Taz eats a bomb it will explode inside of him causing a considerable amount of damage, these bombs can be very annoying especially when they have been placed unfairly, for example a lot of the time the bombs are placed at the bottom of small ledges and you cant see them until you jump off the ledge and sometimes the bombs are placed behind foreground objects so they are impossible to see which makes it very unfair on the player. This entire game relies on the player memorising which platforms are safe and where the bombs are located, if the game had unlimited continues this wouldn’t be as big of an issue but unfortunately the game does have very few continues (not including the ones you can find) making the entire experience of playing the game very stressful and annoying. 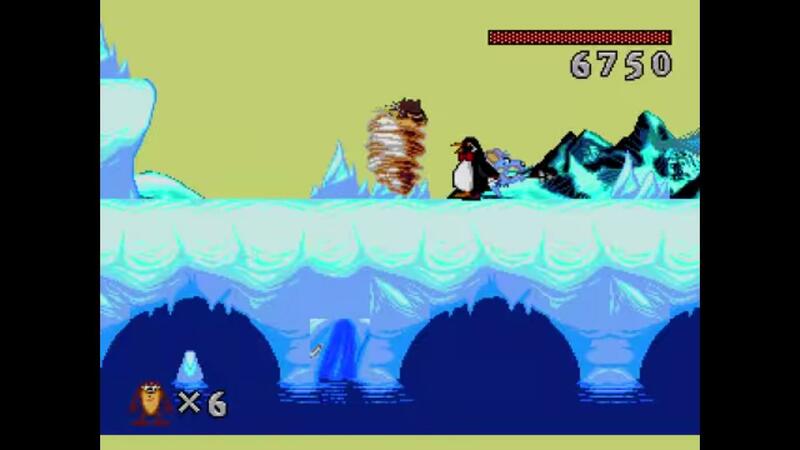 The levels are very difficult due to bad game design but ironically the boss fights are really easy, this is because when Taz is spinning any enemy that hits him is immediately damaged and this is the same for the boss fights, if you keep spinning into the bosses you are going to defeat them very quickly and very easily, there is one boss fight near the end of the game that is so easy too beat that you can defeat him while taking no damage by just spinning in one spot until he dies. The music is not memorable at all most of the songs are just loops of very short tunes and the biggest problem is that you can hardly hear the music over the games terrible sound effects, the sound effects literally sound like they came from a cheap collection of Royalty Free sounds and nothing about them or the music is very creative at all, the most unusual sound choice the developers made was that every time Taz takes a step a music note plays as if the entire game is a piano, this sound choice makes very little sense and it gets annoying very fast. 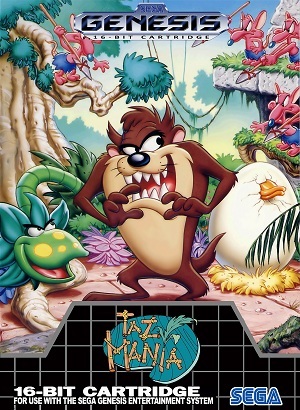 Taz Mania was a very disappointing game, I used to love this game as a child and I remember having a great time playing it, the game has tight controls and sticks to its source material with its very simple plot and and its art style which represents the original show quite nicely but unfortunately bad game design, terrible sound and music choices and for the most part awful game play makes Taz Mania for Sega Genesis a very bad experience and honestly I am relieved that I never have to play it again.